More than 130 residents from across Anaheim crowded into City Hall on Aug. 19 to review more than two dozen proposed district boundary maps and express support for the map that would best serve their communities. In all, residents weighed in on 25 possible boundary maps at the most recent Advisory Committee on Electoral Districts meeting. As part of a meeting series conducted by the City of Anaheim, a volunteer board of retired Superior Court justices responded to resident testimony by selecting five draft maps — three by residents and two by a demographer — for further review, comment and possible refinement. Four maps selected by the Committee keep the Colony and the Anaheim Resort area whole, while a fifth map splits the Resort area. The Committee also directed maps to reflect two majority Latino districts. The Committee has not finalized a map as part of an ongoing process to update the way Anaheim’s City Council is elected. Starting in 2016, City Council members will be elected by districts instead of at-large as they are today. Anaheim’s mayor will continue to be elected at-large. Join the conversation and help further narrow the maps at the next Advisory Meeting on Wednesday, Aug. 26, at 6:30 p.m., at the Western High School cafeteria, 501 S. Western Ave., Anaheim. The City’s demographer is available before and after each meeting to help residents refine the boundary maps that will shape Anaheim’s six City Council voting districts. 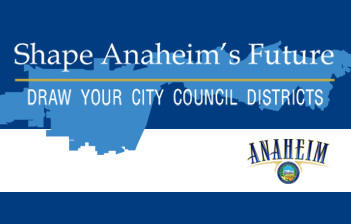 Go to www.anaheim.net/districts for the updated meeting calendar, maps, vidoes, FAQs and background information.